Red peppers are more expensive than green ones for several reasons. The main reason is that green peppers are harvested before ripening, while red peppers are left on the plant longer. The longer growing season translates to increased costs for farmers, which increases the price tag at the grocery store. Additionally, red peppers have a shorter shelf life, which also impacts on retail prices. Peppers can be divided into two categories: sweet (bell) peppers and spicy (capsicum). 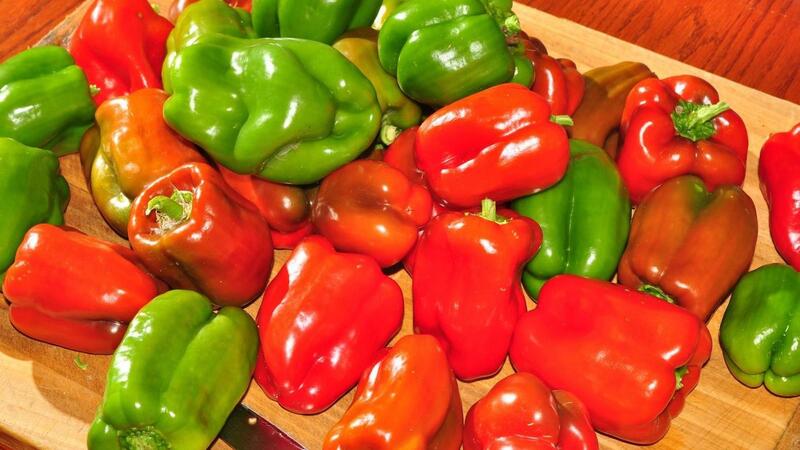 Both types of peppers grow in varying colors, including green, yellow, orange and red. Red bell peppers' increased maturity gives them more nutrients than their green counterparts. For example, red bell peppers have nearly 11 times more beta-carotene and more than twice the vitamin C of green bell peppers. The increased ripening that red peppers undergo also gives them a sweeter flavor. Although green bell peppers account for the majority of peppers that consumers buy, there are many other colorful choices to consider, including yellow, orange, black, purple, brown and ivory peppers. Both spicy chili peppers and bell peppers are native to South America, Mexico and Central America, where the warm soil and climate are conducive to growing these colorful vegetables. Major pepper-producing countries include China, Mexico and Indonesia. Are Green Peppers Just Unripe Red Peppers? How Do You Make Sweet Green Tomato Relish? What Are Some Tips for Roasting Red Peppers?